In the last post we looked at smoothing time series by focusing mainly, or exclusively, on local data, i.e., data which are nearby (in time) to the moment at which we’re trying to estimate the smooth. This is usually accomplished by having an observation window or weighting function which is centered at the moment of estimation, and we let this window “slide” through time to generate smoothed estimates at all times. We even showed that fitting a polynomial or a Fourier series globally (i.e. to all the data at once) gives results which are, for times not near the edges of the observation window, nearly the same. 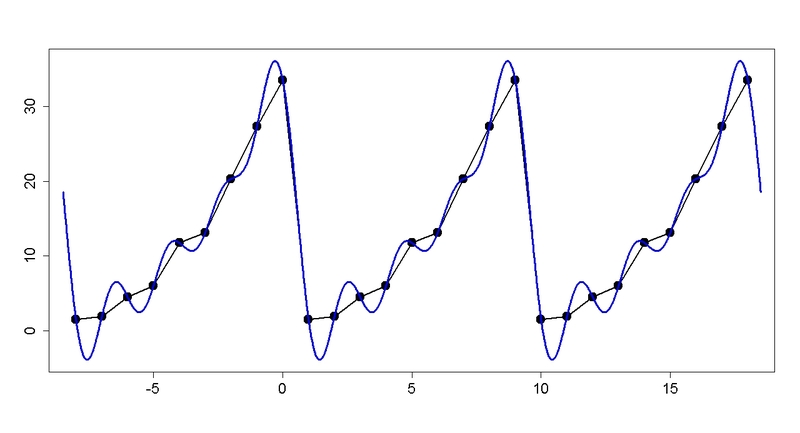 In the last post we looked at smoothing data by fitting a polynomial, and by fitting a Fourier series. We found that we could control the degree of “smoothness” in either case (by polynomial degree or by cutoff frequency) and that with the right amount of smoothness both methods did a reasonable (and sometimes outstanding) job over most of the observed time span, but did much worse near the endpoints of observation. Let’s forget about the endpoint mess for the moment, and concentrate on the performance of the smoothing near the middle of the window of observation. Suppose now that we want to know the likely severity at some point in between those integer-valued measurement points from 1 to 9? What if we wanted to know the severity for an exposure of 4.5, or 2.271? In other words, what if we want to interpolate to get an estimate? 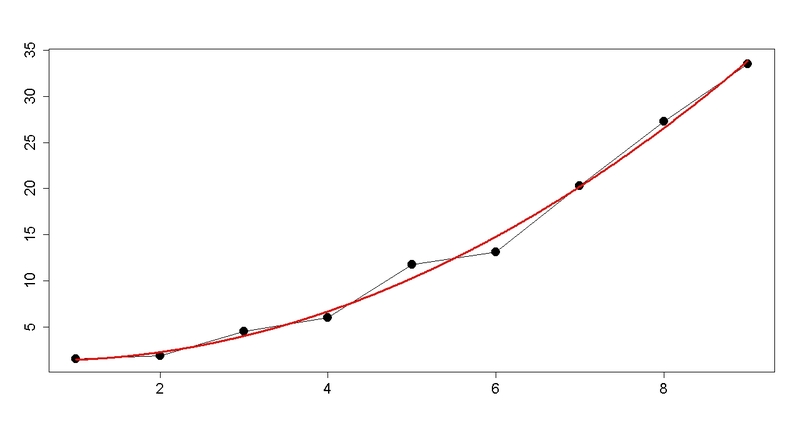 The classic way would be to define a function at all values x from lowest to highest — not just the x values at which we have observations — by simply “connecting the dots” (as has already been done in the above graph). 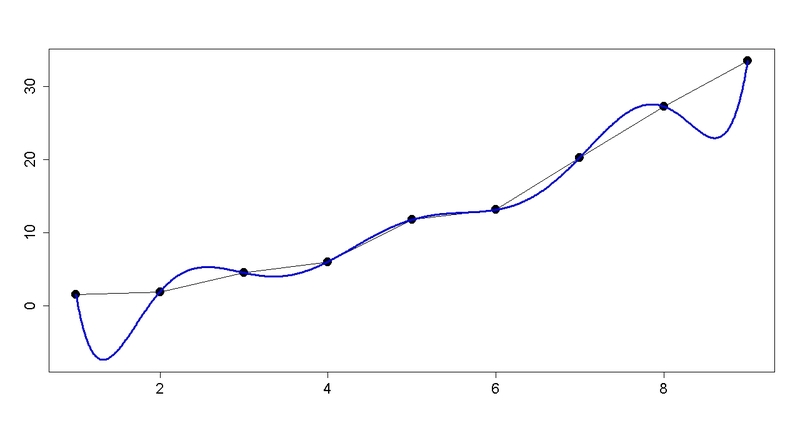 The line segments from one data point to the next define the function values at intermediate x values. That’s fine, and the function so defined is at least continuous. But it’s not smooth, it makes instantaneous changes in direction at the observed x values (in other words, it’s derivative is undefined at the observed x values). In between those values, it’s perfectly smooth — a straight line segment is as smooth as can be — so this “classic” interpolation function is piecewise-smooth. But it isn’t smooth, and the merest glance at the jagged corners connecting the straight-line segments makes that obvious. Pfeh! That’s just as bad the polynomial fit! Hold on for a moment here. We started out saying that polynomials (and the Fourier series) could give us a smooth function through our data — and they do. But then we say it’s not “smooth enough”? Just what does one mean by “smooth” anyway? The strict mathematical definition of a smooth function is one which is infinitely differentiable. Polynomials meet that criterion, as do sines and cosines, so both polynomials and Fourier series do indeed provide us with smooth functions. But we didn’t like the fast wiggling, the jiggling around from point to point of our smooth functions either. What we really want is something that’s more smooth than just the fit-all-the-data-perfectly option. The fit isn’t very good. But it isn’t horrible either. There’s genuine (and statistically significant!) 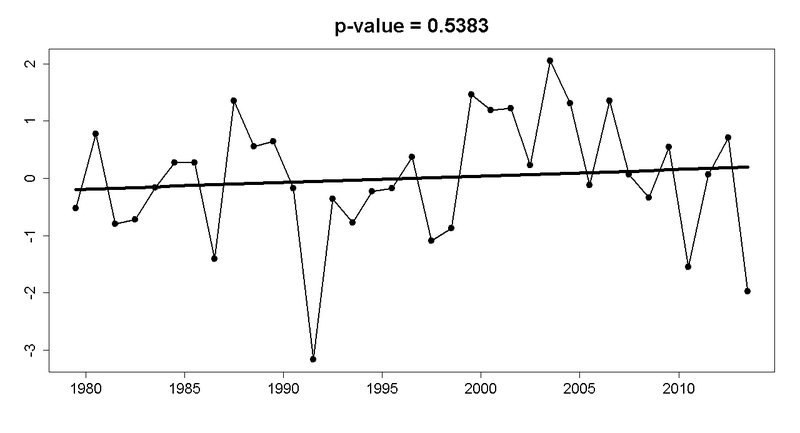 correlation between the data values and the model values. It obviously doesn’t capture the variation well, but it does capture some important aspects of the overall quantitative behavior. 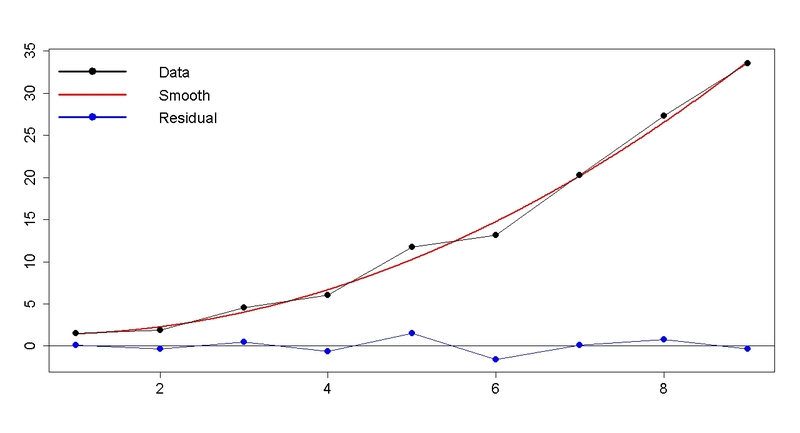 It also highlights a difference when we try to model our data using only sufficiently “smooth” functions. Namely, that our model no longer matches all the data perfectly. There are differences, which we can call residuals. In the case of our 1st-order Fourier fit, the differences are substantial. The match is better but not great, and it’s already wiggling around faster than we were hoping for. But it is getting closer. Now we’re getting somewhere! The fit is outstanding, it’s plenty “smooth” enough to satisfy anybody, and it’s always going in the “up” direction. There are still residuals, although they’re quite small and don’t show any apparent pattern. What we have done is to separate the data into two parts: the smooth part (in this case, a quadratic polynomial) and the rough part (the residuals). We might even hypothesize that the smooth (in this case, the quadratic fit) is our best approximation of reality, and that the residuals are an example of the “noise” (departure from expectation) in the system. And we’d be exactly right. 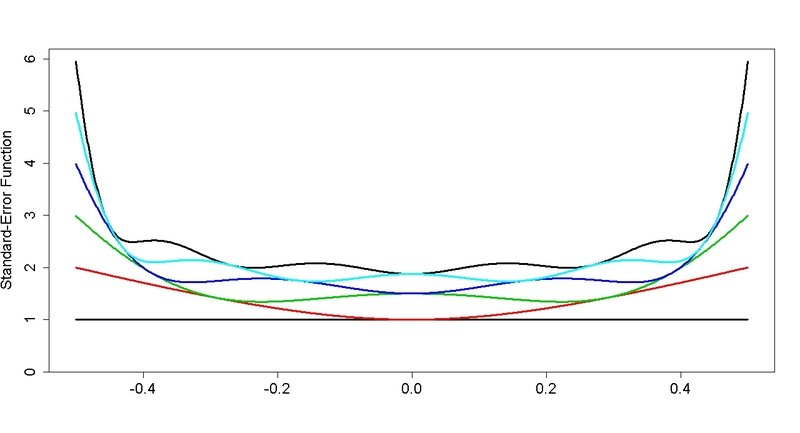 These data were created by computing a quadratic function and adding random noise. 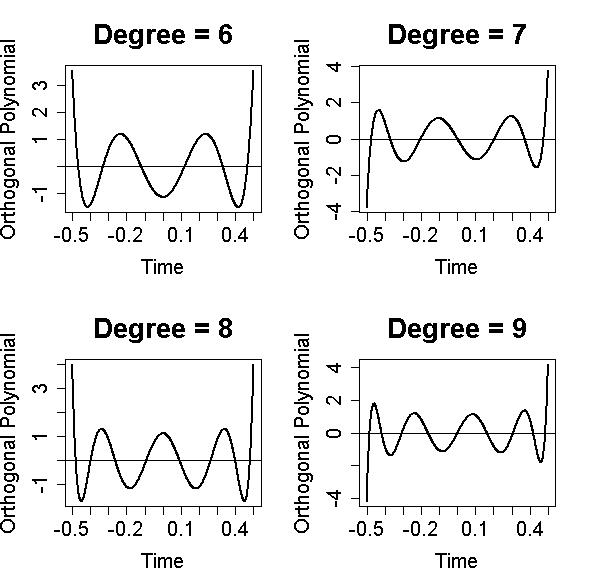 Since the signal itself is quadratic, so is the best polynomial degree for smoothing. For higher degree polynomials, the excess wiggling — especially at the endpoints — is due to the noise in the data. 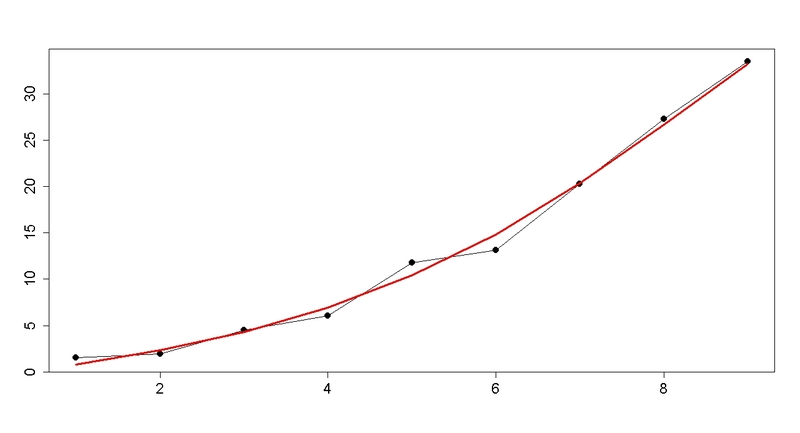 If we fit a straight line (a 1st-degree polynomial) to some data, then we’ve modelled the data with two functions ( and ) so we require two parameters: slope and intercept. 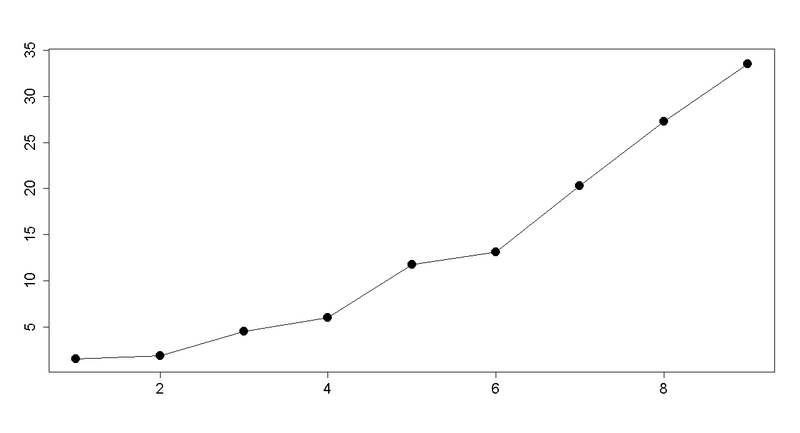 Now increase the order from 1st to 2nd for a quadratic fit. In one sense, the extra “function” we’re fitting is . But that function can easily have nonzero average value, so in a way it is “like” the function which we’ve already included in our fit. What we’re really interested in is what this extra function does that the other functions don’t already do for us. This turns out to be captured, not by power functions , but by “orthogonal polynomials,” each of which is one degree higher, and all of which are “orthogonal” to each other (which, very loosely speaking, means they don’t duplicate the patterns found in the other polynomials). Two things are worth noting near the beginning and end of the observed time span. 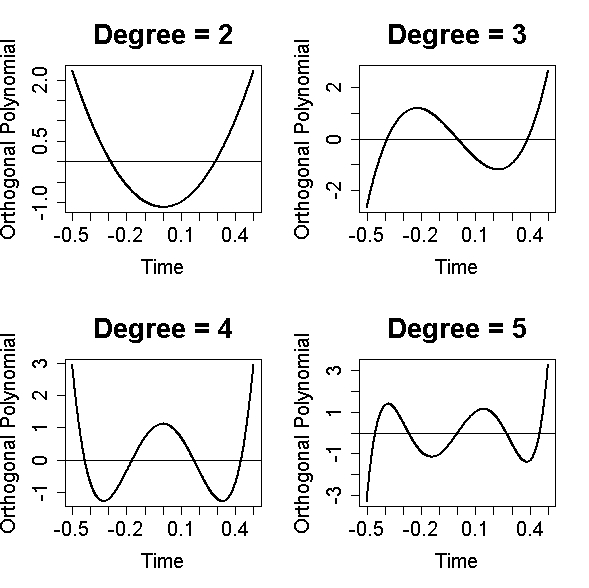 First, the values are larger, more so the larger the degree of the orthogonal polynomial. Second, the wiggles get closer together, i.e. they get faster. These properties of the fit functions persist in the final result, so when we use a high-degree polynomial we tend to get much larger uncertainty (i.e. noise response) as well as bigger and faster wiggles (also due to noise alone) near the beginning and end, exactly as we observed with our 8th-degree polynomial fit. A higher polynomial degree usually only makes things worse. Note how the uncertainty (i.e. the contribution of noise to the smooth function) is exaggerated near the endpoints, the more so the higher the polynomial degree — with just a 5th-degree polynomial, the standard errors are already three times as large at the endpoints as in the middle. 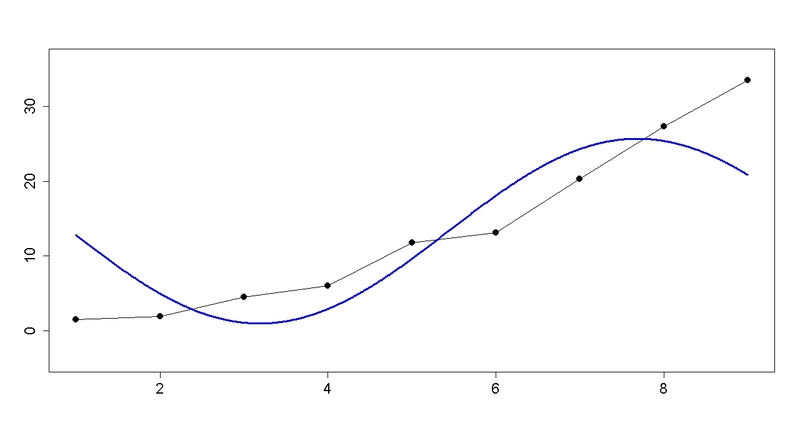 And, don’t forget about that extra wiggling near the enpoints too; the combination of exaggerated endpoint uncertainty and exaggerated endpoint wiggling makes polynomial smoothing with degree higher than 3 or 4 at the most extremely untrustworthy near the endpoints of the time span. Note that in order to repeat, it has to dive back down at the end of each “cycle” toward those low values at the beginning of the next “cycle.” To do so, it has to exaggerate the wiggles, especially at the end. And that’s just to fit the signal, even without any noise. This is another case where the essential properties of the functions we’re using persist in the final result. There are many ways to ameliorate this (and other) problems, but none of them entirely eliminate it. The fact remains that periodic functions have essential tendencies which persist in any Fourier-based smooth, and the problematic aspect is the behavior of the smooth near the endpoints. It should be mentioned that for times well away from the endpoints, a polynomial smooth and a Fourier-based smooth both give oustanding results if the “time scale” (cutoff frequency for Fourier, polynomial degree for polynomials) is well chosen. We’ve tried using classes of functions (polynomials, Fourier series) and restricting them to the “slow” ones in order to keep things sufficiently “smooth.” Perhaps instead we could seek some completely general smooth function which optimizes some criterion which combines both “fit” (how closely does it match the data) with “smoothness.” It’s easy to define how well it fits the data — the sum of the squares of the residuals is only the most common of many methods. But how do we define “smoothness” for some function in general? The idea is that it’s the bending of the smooth curve that accounts for its “roughness,” and that the bending is measured by the second time derivative of the function. Of course, for that to exist the function has to be twice-differentiable, but that’s fine because we want a nice “smooth” function. 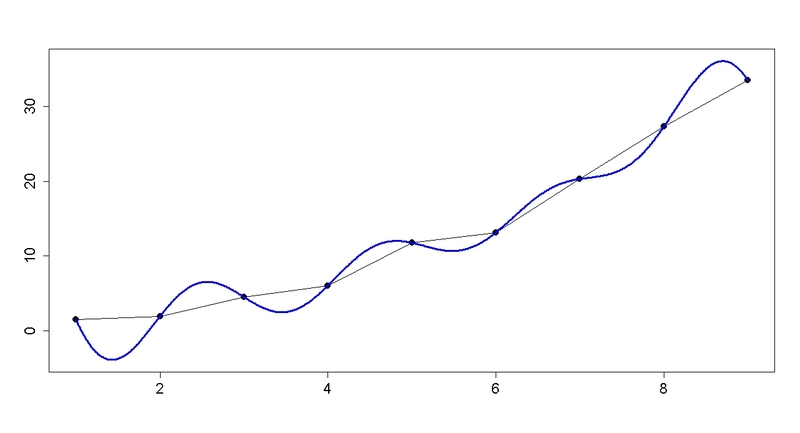 It may not be “technically” smooth (infinitely differentiable) but it will at least be smooth-looking. To measure of the goodness-of-fit (or should I say badness-of-fit), take the usual sum of the squared residuals. To measure the roughness, integrate the square of the 2nd derivative over the observed time span. Combine these two quantities into a weighted average, giving more weight to the roughness if you want an extra-smooth smooth but more weight to the badness-of-fit if you want an extra-good fit. Hence this method involves a parameter (actually it can involve many, but let’s not get into details) which controls how “smooth” the final smooth will be. This is nothing new, with polynomials we controlled smoothness by polynomial degree and with Fourier series by cutoff frequency. 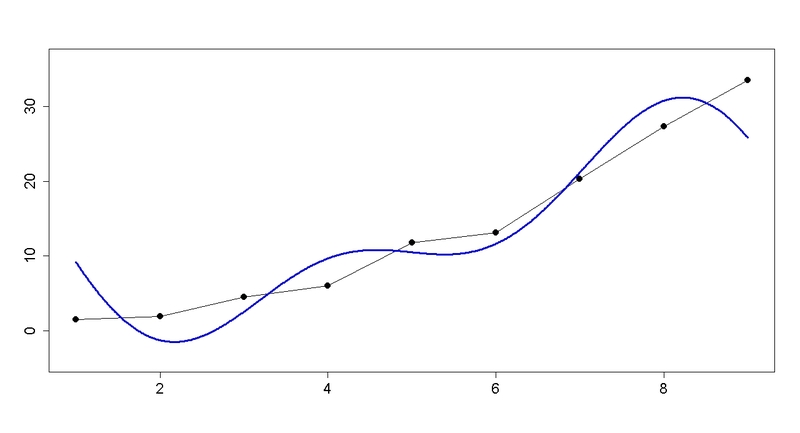 Fitting functions like polynomials or Fourier series to the entire set of data, and finding a function which optimizes some measure of total goodness as a spline smooth does, might be called “global” smoothing methods because they fit a smooth to the entire data set, both computationally and conceptually. However, one can also look at smoothing as a local problem, in which the value of the smooth at some particular time is determined by the data values which are nearby in time to the given moment. In the next post, we’ll take a look at some methods and issues related to local smoothing. This objection comes up so often from those who are accustomed to data which are evenly sampled in the time domain, and the misconception is so firmly imprinted on so many people, that it’s worth illustrating how uneven time sampling overcomes such limitations.